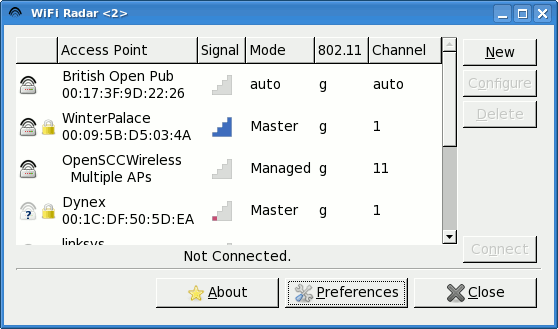 WiFi Radar is a Python/PyGTK2 utility for managing WiFi profiles on GNU/Linux. It enables you to scan for available networks and create profiles for your preferred networks. You can drag and drop your preferred networks to arrange the profile priority. March 22, 2015 - I have released the tenth stable version of WiFi Radar v2.0. Notable changes include fixes for Ubuntu bug 442809, proper scrolling in the AP list with the mouse scrollwheel, and closing WR with Ctrl-C when started from the command line. The last two changes come from Markus Schmidt, who has also provided other improvements that should show up in the WR 2.1 release. With WikiSpot shutting down and Gitorious selling to GitLabs, the WR project is consolidating onto TuxFamily services. I have re-formatted the useful wiki pages into static HTML pages: the User Manual, the FAQ, the "Customize for Linux Distributions" HOWTO, and the "Connect and Disconnect Scripts" HOWTO. The main git repository for WiFi Radar has changed to TuxFamily. March 22, 2014 - I have released the ninth stable version of WiFi Radar v2.0. This does not contain any functional changes, but just updates URLs in various places in the source and documention. WiFi Radar is released under the GPLv2 license. The primary place for bug reports, patches, support requests, and compliments is the mailing list <wifi-radar@lists.tuxfamily.org>. "Python" and the Python logos are trademarks or registered trademarks of the Python Software Foundation, used with permission. Linux is a registered trademark of Linus Torvalds.